This one is just about completed. I think I will tweak the shadows a bit, deepen them some more to bring out the highlights, but otherwise, I think it's done. Okay, now this doesn't really seem to be a study in white, what with a red canister sitting smack dab in the middle of the picture, but it is. I added the canister in order to liven up the pic a bit, and to get the interesting red reflections off the white. The whites on the right side of the painting I did in cool grays (my favorite grays! 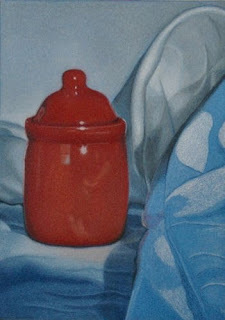 ), sky blue light, white, and poppy red for the reflection off the canister. The white cloth the canister is sitting on I did mostly in periwinkle, sky blue light, white, cool gray 10% and 20%, and indigo. The white wall I did in cool grays and sky blue light. The canister was done in deco pink, poppy red, scarlet red, crimson red, crimson lake, tuscan red, jasmine, cream, indigo, black, and white. This piece was created for a member exhibition on Ann Kullberg's Ezine "From My Perspective." This is a new study I'm doing. I set up this still life with drapery in white as the main focus. But that was a bit boring, so I decided to add a colored object into the mix. This small canister seemed to do the trick. Not only did it liven up the composition a bit, but it also added very nice colored reflections onto the white drapery. 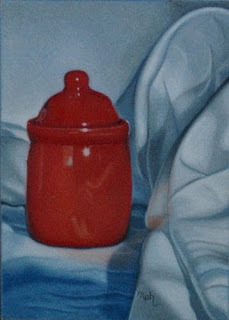 The white cloth the canister is sitting on I did with several blues and some white. That part still needs some work. The drapery on the right side is being done in cool grays and white. The wall in the background was done in grays also and will be darkened up some more to bring out the white drapery on the right. 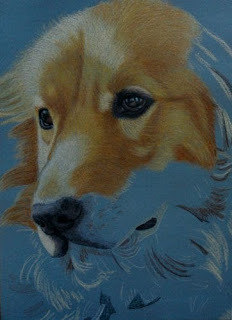 This is being done on white 5" x 7" Pastelbord. I used light blue Neocolor II as a watercolor wash on the Pastelbord first, which you can still see on the right hand side. Then I transferred my drawing to the bord, and began adding colors. I am, naturally, using my stencil and bristle brushes to blend. This should be done this weekend. Not too much more to do, then I'll just have the tweaking. Here is Jessica all done. I didn't get a good pic before I had to send her off for an exhibition, but she is back now. 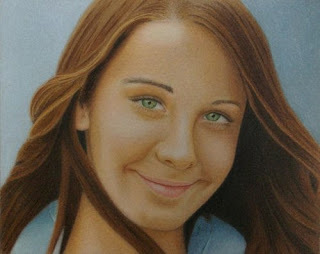 Jessica won first place in the professional division of Colored Pencil Portraits. This is the second shelter animal in my Faces of Love shelter series. I'm not sure the colors are quite right here. I think my large display is a bit off, both in brightness and in color. This lovely dog had a beautiful golden glow about him when I took this pic as he soaked up the sun outside the shelter. His pensive look reveals his apprehensiveness over his future. I do believe that the animals in shelters realize their situation is critical and desperately want a place to call home and people to love them as much as they are willing to love in return. This big guy arrived at the shelter happy and full of life - ready to play - yet was able to calm down and sit quietly when necessary. He was able to completely capture the hearts of not only the shelter workers, but the visitors as well. He was adopted so fast, the shelter didn't even have time to name him. I barely had time to include him in the photo shoot! The slight bit of background you see in the upper corners are actually the color of the board. I decided the color complemented the dog and left it at that. I will be spraying permanent fixative and varnish on it so it can be framed without glass or mat. Finally , here is a close-up of his eyes for those of you who like close-ups. Tools: Stencil brushes for blending. There is NO watercolor underpainting on this one. Got quite a bit done yesterday. The colors I've used on the fur so far are: cream, jasmine, yellow ochre, light umber, dark brown, mineral orange, pumpkin orange, white, black, indigo blue, sienna brown, and burnt ochre. I have several other colors I'm considering adding as well. 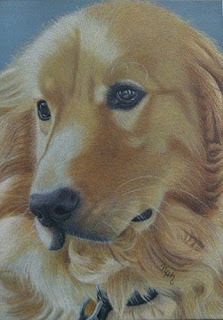 This dog is one of the more colorful golden retrievers rather than just plain blond/buff colored. I can see a few adjustments I need to make, like the left eye. I know exactly what I need to fix there, so I'll work on that this weekend. I don't have a lot of detail included in this painting yet. I always put in the detail at the end. We'll be away to our church's homecoming this weekend. Nine preachers in two days!!! Now that's church! Especially when they are as good as these guys are. I'll be taking my laptop with me, but not sure if I'll be able to do much on the painting while I'm gone. I will try though. 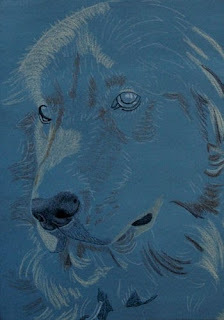 The second in my "Faces of Love" series to raise money for my local shelter, is this beautiful Golden Retriever. He didn't have a name at the time I did the photo shoot, unfortunately. He was a sweet, calm, and loving dog. Thankfully, he did get adopted. I started this on white Pastelbord. I used steel grey Neocolor watercolor stick to put a couple of light layers on the bord as an underpainting to start. I then transferred my sketch with white transfer paper. I am using only Prismas .... so far at least. 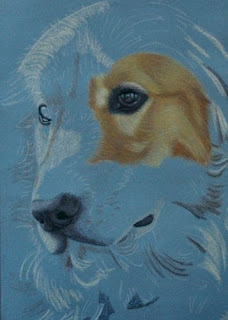 I began the dog by applying the highlights and shadows first. 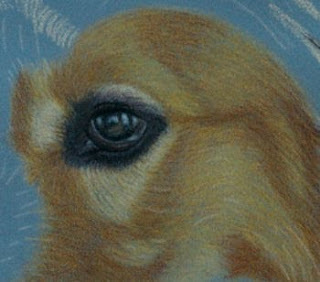 Then, as usual, I began the first layers on the dog's nose and then his eye. From the eye I began to spread out, covering one section at a time. I am using bristle and stencil brushes to blend the colors and smooth out the surface of the bord. I am spraying it with Krylon Workable Fixative after each session on it to prevent wax bloom. After I'm finished I will spray it with a permanent fixative and then varnish.